Erdene Resource Development Corp. (TSX:ERD) ("Erdene" or "Company") is pleased to announce additional assay results from the Company's on-going 2017 drill program at its 100%-owned Bayan Khundii Gold Project ("Bayan Khundii") in southwest Mongolia. Sixteen holes (BKD-183 to BKD-198) and one hole extension (BKD-30ext), totalling 3,074 metres, were drilled throughout the Bayan Khundii project area in mid Q3 and are included in this update. The following table includes highlights of the drill results with a discussion expanding on those results below. (1) Reported intervals are not true width. At this time, there is insufficient data with respect to the shape of the mineralized system to calculate true orientations in space. They represent drill intersection widths from holes drilled at a dip of -45 to -65 degrees and oriented to the north-northeast. The Bayan Khundii mineralization is interpreted to be moderately dipping (approximately 40 to 50 degrees to the southwest). (2) Previously reported, May 24, 2016, 59m to 85m (end of hole), 26m of 0.76 g/t gold. Drilling continues to result in improved confidence and continuity in the area between the Midfield and Striker Zones. Prior to the 2017 season limited drilling had taken pace in a 200 metre wide zone separating Striker from Midfield. Hole BKD-194 is the latest in a series of holes confirming strong continuity between these two high-grade zones. This hole returned 22 metres of 3.3 g/t gold within 128 metres of 1.14 g/t gold. A series of mostly shallow holes tested a prospective north-northeast trending area characterized by a sub-vertical intrusive that parallels the trend of the high-grade Bayan Khundii mineralization through the North Midfield area and along the western side of the Northeast Zone (BKD-184, 185, 186 and 192). The syenite intrusive was intersected at relatively shallow depths in three of the holes, between 48 metres and 110 metres depth after intersecting Cretaceous in the top of the holes. However, the most northerly of the four holes did intersect a thick package of altered Devonian volcanics to the end of the hole at 200 metres. Locally anomalous gold, arsenic and antimony with up to 2 metres of 1.3 g/t gold within zones of intense alteration enhances the potential of this northern extension for future drill testing. Three holes tested potential continuity of gold mineralization west of the Midfield Zone (BKD-183, 189 and 190), an area that has received limited drilling to date. Two holes immediately west of Midfield (BKD-189 and 190) intersected deep zones of moderately altered Devonian volcanics with locally anomalous gold (6 metres of 0.4 g/t) but not of the alteration intensity of Striker or Midfield. Hole BKD-183, one of the more northwesterly holes drilled to date, at 250 metres northwest of the Striker Zone, had similar characteristics but did exhibit zones of increased alteration with anomalous gold (7 metres of 0.4 g/t). Interestingly, given this hole is in the direction of the Company's recently acquired Ulaan copper prospect, it did exhibit zones of anomalous copper with up to 0.17% copper over 2 metres. Two holes were completed to the northeast of the Striker Zone (BKD-187 and 197) testing for continuity in the area of previously completed hole BKD-118. BKD-118 returned 10 metres of 12.8 g/t gold earlier this year. Hole BKD-187, 74 metres northeast of BKD-118, did not intersect significant mineralization however, hole BKD-197, drilled 35 metres down dip of BKD-118, intersected 6 metres of 2.7 g/t gold. One hole (BKD-195) also tested a shallow (50 metres depth) target located 1 kilometre east of Midfield to test a near-surface resistivity anomaly intersecting Cretaceous basalt. Additional drilling will be completed in the area northeast of Striker in Q4-2017. The western edge of the Striker Zone, between Striker and the newly developing western zone, had limited drilling previously due to poor results in shallow drilling. However, with the results from the Midfield-Striker connection zone indicating deeper mineralization potentially plunging under these shallow holes, two holes were completed to test this theory and were successful. The extension of previously completed hole BKD-30 was extended from its previous 85 metre depth to 163 metre depth and intersected 58 metres of 1.2 g/t gold including 16 metres of 2.8 g/t gold, and BKD-196 also returned 22 metres of 2.4 g/t gold. A single hole (BKD-198) was drilled in the under-cover area 130 metres west of the Striker Zone to test the down-dip potential of previously completed hole BKD-32 which returned a broad zone of low-grade mineralization during 2016 drilling (115 metres of 0.4 g/t gold). BKD-198 has confirmed higher grades at depth with 25 metres of 1.4 g/t gold and individual 1 metre samples up to 16 g/t gold. The Company has completed a total of 19,386 metres in 2017 at Bayan Khundii (102 new drill holes and five extended drill holes), for a total of 30,728 metres (198 drill holes) since the first drill hole in Q4-2015. For the remainder of Q3, and into Q4, the Company's drilling program at Bayan Khundii will be focused on testing a series of geophysical and geochemical targets within the larger 2 by 1.8 kilometre Bayan Khundii prospect area. Planning for additional drilling is underway and expected to include further delineation of newly discovered high-grade mineralization encountered during the Q2-Q3 2017 exploration program and increasing confidence in the ultra high-grade domains. In addition to the on-going Bayan Khundii drill program, the Company will complete regional exploration and drilling between Bayan Khundii and its Altan Arrow gold-silver project, located 3.5 kilometres north of Bayan Khundii. 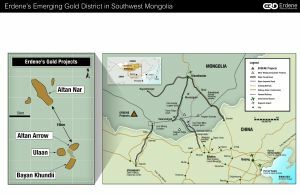 The Company also has a follow-up drill program underway at its neighboring Altan Nar gold-polymetallic project, located 16 kilometres northwest of Bayan Khundii. This program includes testing of newly defined geophysical targets and completion of step-out drilling in areas adjacent to its previously reported NI 43-101 mineral resource estimate at Altan Nar (see Erdene news release dated March 31, 2015). Based on upcoming Q3/Q4 2017 drill results, and on drilling completed at Altan Nar in 2015 and 2016, it is anticipated that a revised resource estimate at Altan Nar will be completed in 2018 in addition to a maiden resource estimate for Bayan Khundii. In Q2-2015, Erdene conducted an initial exploration program on the southern portion of the Company's 100%-owned Khundii exploration license in southwest Mongolia where an early rock-chip sampling program revealed multiple very high-grade surface quartz veins that returned up to 4,380 g/t gold. Since that time, drilling has revealed the presence of very high gold grades, with up to 306 g/t gold over 1-metre intervals, within broad mineralized zones, with up to 131 metres of 3.9 g/t gold, including 80 metres of 6.0 g/t gold. 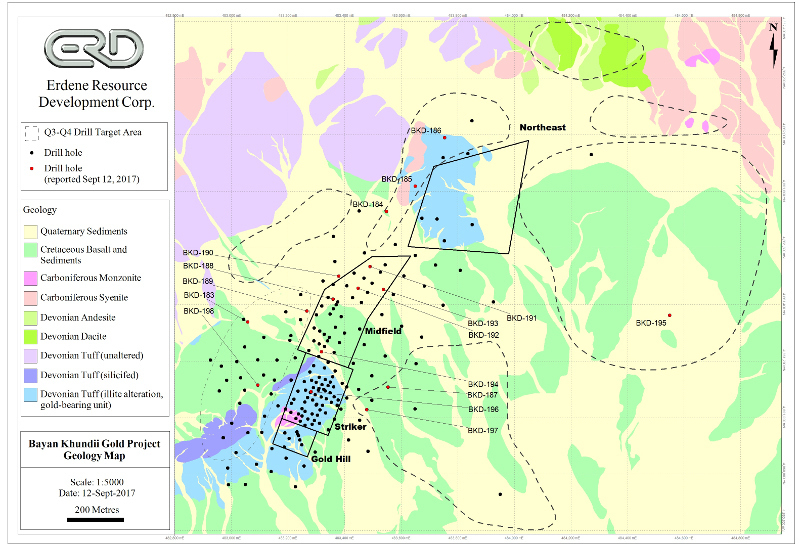 In addition to the drilling discussed above, the Company has completed a comprehensive exploration program at Bayan Khundii that has included: geological mapping; soil geochemical surveys; additional surface rock chip sampling; a ground magnetic survey; gradient array and dipole-dipole induced polarization surveys. 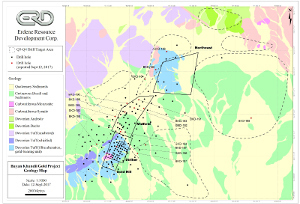 In addition to this work, a series of detailed follow-up studies have also been completed, predominantly on drill core and minor surface outcrop, including: petrographic and mineralogical analyses; a fluid inclusion study; SEM gold composition analysis; Short-Wave Infra-Red Analysis (SWIR); structural analysis; and overall petrogenetic analysis. Detailed studies indicate the mineralized zones can be characterized as low-sulphidation, quartz-illite-adularia type mineralization that was presumably formed in an extensional environment. In Q1-2016, the Company concluded preliminary metallurgical test work at Bayan Khundii, indicating that gravity concentration and cyanidation of the gravity tails yield very good overall gold recoveries for both high-grade and low-grade composites, yielding 99% gold recovery from the high-grade composite (24.9 g/t gold) and 92% gold recovery from the low-grade composite (0.7 g/t gold). Additional metallurgical work is underway with completion anticipated in Q3-2017. Erdene Resource Development Corp. is a Canada-based resource company focused on the acquisition, exploration, and development of base and precious metals in underexplored and highly prospective Mongolia. The Company has four exploration licenses, a mining license, and a recently optioned exploration license, in southwest Mongolia. 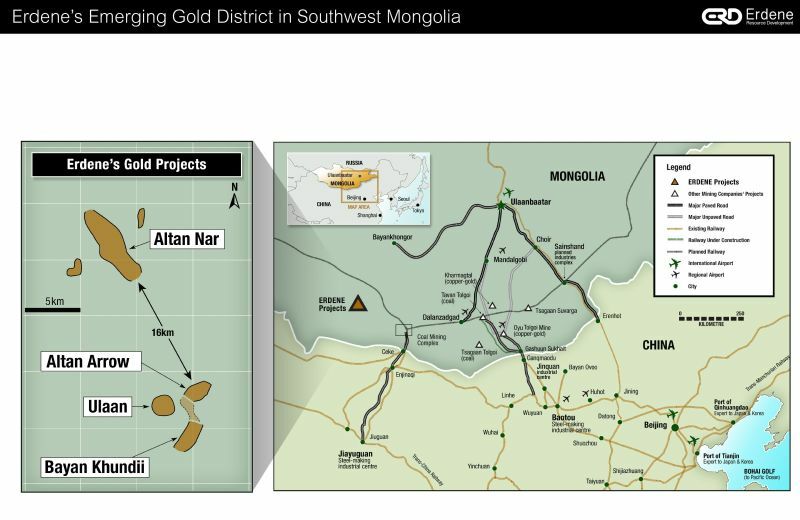 In addition to the Bayan Khundii and Altan Nar projects, other deposits and prospects within these licenses include: Altan Arrow - an early-stage gold-silver project; Ulaan - a recently acquired (option to earn 100% ownership) copper porphyry and gold epithermal project immediately west of Bayan Khundii and Altan Arrow; Khuvyn Khar - an early-stage, copper-silver porphyry project with multiple drill targets and significant copper intersections; Nomin Tal - a narrow, high grade copper-gold discovery; and Zuun Mod - a large molybdenum-copper porphyry deposit. In addition to the above properties, the Company has an Alliance with Teck Resources Limited on regional copper-gold exploration in the prospective Trans Altai region of southwest Mongolia. For further information on the Company, please visit www.erdene.com. Erdene has 145,963,086 issued and outstanding common shares and a fully diluted position of 156,592,160 common shares.